Ever wonder where weavers got the idea to depict, color and outline Afghan provinces in map rugs, like this rug (War Rug #299) ? Below is a stunning semi antique rug recently acquired by warrug.com establishing a precedent for rugs depicting a country subdivided into different colored and outlined provinces. The rug below is all silk pile on silk foundation, 5′ x 6′, mid 20th Century, first half 20th century, woven between 1929 and 1940. It is available, please contact us for more photos and information. Update: Researching this rug has been a challenging and intriguing process. The date attribution is based on development of the railroad in Iraq. 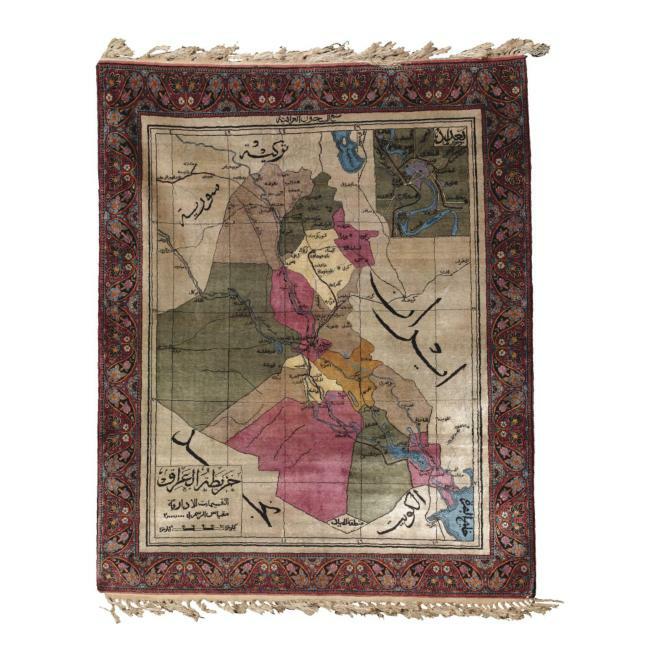 I know of a published illustration of a Tehran rug, circa 1920, showing “The Map of Modern Iraq”. It shows provinces outlined, named, and rendered in different colors, as well. This entry was posted in Baluchi Patterns, Rug Images on June 22, 2007 by Kevin. Those rugs exist in two types the map of iraq and the coat of arm of the kingdom of Iraq. They were made by the prisoners (male or female) in the 30’s & 40’s under the direction of Mohamed al Teherani who was teaching the prisoners and designing the carpets. They were made as Teheran style. They were given to decorate the offices of the ministers during the kingdom of Iraq.